Passat Variant R-Line Edition is only for the European market. With the Golf SportWagen (and Alltrack), Volkswagen remains one of the few automakers still offering traditional wagons in North America. But it's been a while since it offered a long-roof version of the Passat on these shores. And looking at this latest special edition, we can't help but feel left out. Part of the German automaker's lineup for the Geneva Motor Show this week is the new Passat Variant R-Line Edition – a rather sporty take on a versatile model that, sadly, won't make the transatlantic voyage to US showrooms. 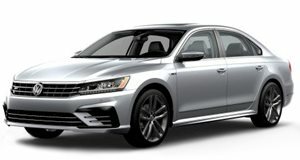 The special edition is based on the recently revised version of the European-market Passat, which has, since the New Midsize Sedan launched here in 2011, been an entirely different model from the one we get in America. The R-Line Edition comes in Moonstone Grey with blacked-out trim. Everything from the roof, spoiler, and cargo rails to the headlight surrounds, mirror caps, window frames, and rear diffuser are all done up in black. The LED tail-lights are darkened, and the 19-inch alloys feature a gloss black finish as well. The murdered-out treatment even extends into the commodious interior. Black leather upholstery covers the R-Line sports seats and is complemented by brushed steel pedals and stainless-steel side sills. And it comes packed with all the optional extras, from LED matrix headlights and ambient interior lighting to the 9.2-inch infotainment system and Travel Assist suite. Only 2,000 examples will be offered, with either the 240-horsepower turbodiesel or a 272-horse gasoline engine. Both feature 4Motion all-wheel drive, but unfortunately we Yankees won't be able to get our hands on either. So we'll just have to make do with an Passat sedan, Atlas crossover, or Golf SportWagen. No matter how well the Toyota Camry and Honda Accord sell, Germany will keep doing its own thing. The Honda Accord outsells the Passat by almost 5 to 1, but is it actually better?